What are we looking at here? Each row is a single taxi represented over 24 hours. Each pixel of width represents one minute. There are 60 minutes in an hour, and 24 hours in a day, giving us 1440 pixels of width. Each row is 4 pixels high, so there are 360 taxis represented in this image. Yellow means the taxi had a fare, black means it did not. We can see two big fuzzy stripes of black running vertically across the image: One in the early morning hours between 4 and 8 am, and a less visible one in the afternoon, which I assume represents shift change (where cabbies aren’t carrying fares because they are refueling or traveling back to their base). Edit 1/13/15: Now you can buy a print of NYC Taxi Defrag from my store! Read on if you are interested in how this was built. First, here’s my code on Github. The data source for this is NYC’s 2013 Taxi Tripsheet data, which I received via FOIL request and published in the Summer of 2014. 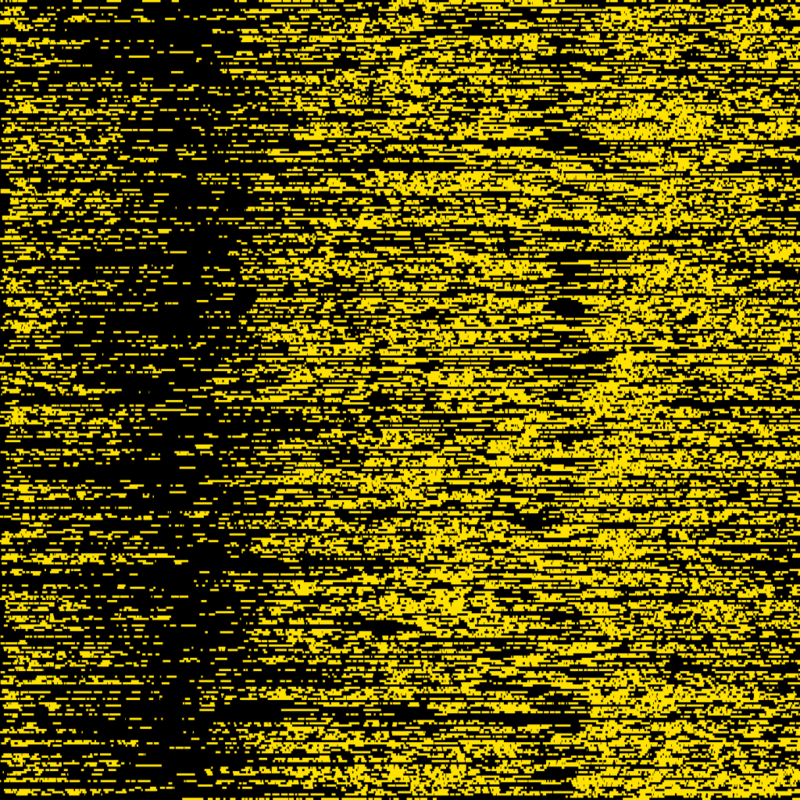 Next I wrote a little script in node that would parse the CSV and create a row of this image using HTML5 Canvas. Since each pixel is a minute of the 24 hour day, I had to convert the timestamps in the data (which look like 10/7/13 0:01) into integers representing the number of minutes since midnight. This was easy with the help of moment.js, which can effortlessly parse the input strings, and just as effortlessly display minutes and hours. A little math converts the hours into minutes, and gives me an integer that I can use when drawing canvas rectangles. Once I had a nice array of objects for each cab/day, I passed each one to the following function which draws the appropriate canvas elements. Finally, I create a new html file with an image built using canvas.toDataURL(), and use the node package “open” to automatically open it up in my browser for viewing. 4 Responses to "My First Data Art: NYC Taxi Defrag"
Summing this data and scaling LR and UD clearly shows the taxi loading by unit and by time. Hi, this is very cool. May I ask where you get your prints made?